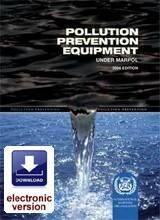 The purpose of this publication is to provide easy reference to the International Maritime Organization (IMO) resolutions on shipboard pollution prevention equipment that are required under MARPOL. MARPOL requires ships to be fitted with certain pollution prevention equipment, including oil filtering equipment, oil discharge monitoring and control systems, oil content meters, oil/water interface detectors, sewage treatment plants and shipboard incinerators. Such equipment should be of the type which has been approved by Governments in accordance with the relevant resolutions adopted by IMO. Over the years, IMO has adopted a series of resolutions on pollution prevention equipment standards and test specifications which have been kept continuously under review following the experience obtained on their performance and taking into account the advancement in technology. Consequently, many of the early resolutions adopted in the 1970s and 1980s became obsolete and have now been replaced. Guidelines On-board Gas-SOx Cleaning Systems.